I was sooo excited to see this in the mail when it finally came in! The packaging and labeling was very discreet (I still live with my parents, and my mom picked it up and read "1 Costume," and I just KNEW), which of course is a big plus for me! The cute little pumpkin sticker on the outside was precious, and I got to have a sweet watermelon-flavored sucker as a pleasant surprise :) The care sheet is very informative, and the pink wrapping just makes it feel like it's Christmas!! As for the ears themselves, they came already molded/sculpted/etc. and fluffed, and touching the fur is both relaxing and exciting! I adore them with all my heart, and would definitely recommend them to any Kitten who loves pink fluffy things! 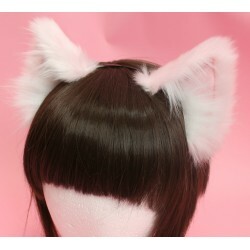 I just placed another order for a tail, and I'm very eager to expand my collection with KPP! Thank y'all so so so much! !